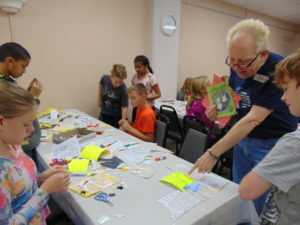 Norm Knott discusses creative uses of found objects with fifth graders during his Junk Art class during the Fifth Grade Arts Festival at the Community Building Complex. Planning for the annual Fifth Grade Arts Festival has been ongoing since last spring. The Boone County Arts Council offers this three-day event to allow children the opportunity to interact with professional artists who show them what their special area of art is all about. This year six District 100 schools, St. James Catholic School and Immanuel Lutheran School participated in the event. Lincoln Elementary and Seth Whitman Elementary Schools attended the event on Tuesday, Oct. 23; Caledonia Elementary School, Washington Academy, and St. James Catholic School were in attendance on Wednesday, Oct. 24; and Thursday, Oct. 25 saw Perry Elementary, Meehan Elementary, and Immanuel Lutheran Schools at the Community Center Building, 111 W. 1st St. for the event. The classes begin together with a session of folk music by Mark Dvorak. “This is my sixth year,” he said. “This program has evolved over the course of 20 years. The songs I choose are never too different but they are never all the same. This is what folk music is – our songs are the bearer of history and culture. Some of the songs were new to the kids, other songs were sing-along fun for all. From that auspicious start to the day, the classes separated into groups to spend time with the other artists. Dance – Mary Read of the Rockford Dance Company has been teaching for 15 years. “I love to promote a healthy, active lifestyle to kids whenever I have a chance,” she said. She began with warm-up, stretching moves and taught them part of Michael Jackson’s ‘Thriller’ dance. Junk Art – Norm Knott is a mixed media artist who creates works that use natural and man-made ingredients. He creates with found objects and trash and gives them new life as decorative and/or useful items. Improv – Dan Holmes studied at Chicago’s Second City before coming to Belvidere to teach theater. His workshop introduced students to some theater games and ensemble improv work. Puppetry – Gary Tate is a retired elementary and middle schoolteacher who has done puppetry workshops for many years. He is also deeply involved in Main Street Players of Boone County as an actor and as a director. Jeremy Schulz has taught courses in photography video, visual effects, and motion graphics design. His work can be seen on the Arts Council website and print materials and has volunteered his work with Paint on State. For complete article, pick up the Nov. 1 Belvidere Republican.